What happens when you handover a campaign postcard? A while ago, one of my colleagues got to speak to a former ministerial Special Advisor (SPAD) to find out what really happens to all those campaign postcards we send to a government department. 1. All correspondence goes to the correspondence unit. There’s no mechanism to make anyone outside the unit aware of it. However SPADs and Ministers can enquire about what the public’s writing in about, and SPADs in particular are likely to make sure they do as a good way to keep in touch. 2. Ministers will sign and read replies to letters or emails from MPs, and usually from directors of NGOs (sometimes from other senior staff) and will also read the incoming correspondence at the same time. That’s the only correspondence they’ll usually see. 3. The department may choose to post a reply to a public campaign on its website, usually if a SPAD says they should. That’s a good way to see what they think is worth taking notice of. 4. It works well for an NGO CEO to write to a minister to say how many campaign messages they’ve received and say what they’re asking the minister to do. 5. Hand-ins are a very good way to get a minister’s attention, if something is personally handed over to them. They’re more likely to agree if they think the photo will get good media coverage, and if there’s a celebrity involved, or someone who is seen as a celebrity by a particular audience. A hand-in with no minister present won’t come to a minister’s attention (unless you got media coverage for it). What other insights do readers of the blog have about how to ensure your campaign postcards get noticed after a handover? A couple of timely reminders about why feeding back on the success (or otherwise) of our campaigns is so important. Firstly, the findings of a substantive piece of research on ‘Understanding public attitudes to aid and development’ from the thinktanks ODI and IPPR. As the Campaigns Totals work that I’ve carried out over the last few years shows, the development sector in the UK has some of the most active campaigning departments generated hundreds of thousands of actions every year. In light of that, the findings from a number of focus groups across the country on what people thought about development and aid are important. While the report is reflecting on all the communications that have come from the sector of which campaigning is only part, the researchers found a new trend that highlights the importance of sharing stories of success, including in our campaigning is as important in helping to demonstrate that we are making a difference, even if the direct causality is hard to show. But something polling and surveys have not highlighted to date is the extent to which some of the communications and fundraising images NGOs and governments use may have contributed to public scepticism – the repeated use of images that show people living in desperate need has created an impression that very little has changed over the past few decades. While the challenges from the report need to be taken on by more than just those involved in advocacy campaigning within the development sector, I think it presents a clear challenge for any sector of the danger of repeatedly asking people to take action without actively feeding back on the impact that their actions have had can have. Secondly, was anoter great email from the team at SumOfUs.org. Sadly I can’t find a copy of the email on the web anywhere, but the message which was entitled ‘OFFICIAL REPORT-BACK: April-June‘ was an excellent example, taking me through the 6 or so key campaigns that SumOfUs.org had been behind over the last few months and summarising the impact that the movement has had. Our tiny team (just 5 people!) can’t take on these corporations on our own. But when the whole SumOfUs.org community — over 680,000 conscientious consumers around the world — comes together, corporations sit up and take notice, and magical things can happen. All told, we’ve taken an astounding 2,655,793 actions since our inception just six months ago. 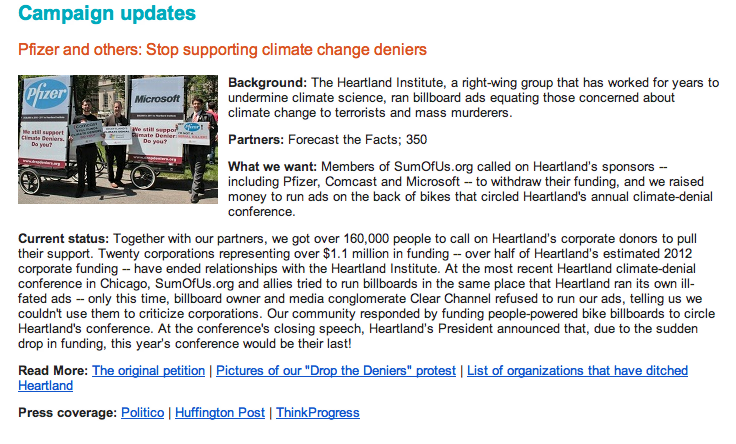 And lately we’ve won some big campaigns — like driving out more than half of all corporate funding for the climate-denying Heartland Institute. So, read on below and see more of what we’ve accomplished together! It’s a great example of how to do feedback well, and given the findings of the IPPR/ODI report a timely reminder of the importance of doing it. On Wednesday, I’ll be sharing the first results this years campaigns totals survey. Like last year I’ve been using Freedom of Information to find out how many campaign actions different government departments receive each year. I was amazed by the response that I got last year, with the results covered in Third Sector magazine and numerous campaigners getting in touch to say how helpful they’d found the information in their own internal benchmarking. I hope that this year results will prove helpful for campaigner from across the UK. The total number of campaign letters, postcards and emails that appeared to be part of a coordinated campaign you received from 1st May 2011 to 1st May 2012. The breakdown of these numbers by delivery method (letter, postcard and email). A breakdown by topic and/or organisation(s) where you received more than 500 items of correspondence (through any delivery method) that appeared to be part of a coordinated campaign in the period defined above. At the end of the process, when I’ve got results from the majority of the 20+ government departments I’ve approached I should be in a position to share a total number of actions generated to Whitehall in the last 12 months and the split between e-actions and offline actions. This year I’m also going to be able to try to define a ‘par’ score for each government department – based on the information over the last 2 years I want to find out what like in golf, the number of actions that a department my expect to receive and therefore which campaigns are able to break through this to show real traction. I’m also going to be interested to see what impact online campaign platforms have had in the campaign environment. Last year Avaaz showed up in the top 15, but 38 Degrees didn’t, I wonder if the focus on the NHS Bill has changed this, and what impact has the launch of change.org in the UK has had on the totals. It’ll also be fascinating if the launch of the No10 petition site has had an impact on the number of actions. Is it a site that’s bringing more organisations and individuals into taking campaigning action, or is it displacing actions from more traditional methods. My sense is that most campaigning organisations haven’t really embraced this tool, so perhaps this has increased the overall total. Thomas, Can I bring your attention to The Times Cities for Cycling Campaign which is trying to make a real push to improve the cyclists lot and safety particularly in our cities but not exclusively. There are already some top people signed up to it (most UK cycling Olympic team members, Boris J and Ken L, Gabbi Logan, Jon Snow, James Cracknell)….. It was in response to the biggest public policy campaign to launch last week didn’t come from an NGO or a pressure group but The Times newspaper, which launched the campaign on Thursday motivated by a tragic cycle accident that left one of its young reporters in a coma last year. As a response, the papers campaign is calling on the adoption of an 8-point cycle safety plan in cities across the country. As I write the paper is suggesting that 17,000 people have supported the campaign, and over 600 have emailed there MP. Now The Times isn’t the first newspaper to launch a campaign to change public policy, indeed seeing it reminded me of a conversation that I once had with a former Government PR Advisor who suggested that many of the campaigns that are launched are worked out with a certain level of collusion with the government beforehand, but it’s a good case study to look at. To see what the newspaper has done well in the first few days of its campaign, and what it could improve on, but also the massive potential opportunities for the right campaigning partner to come alongside a newspaper on. So what are they doing well? They give profile to a previously overlooked issue – Now this is obvious, if you’ve got a daily readership of 400,000 people, plus excellent connections with credible spokespeople (see the use of many of our Olympic cycling medalists) it’s easy to give a huge amount of profile to the issue that has perhaps previously been overlooked, and that’s certainly true with the editorial coverage of this campaign. The website Road.cc has a nice breakdown of everything they’ve covered and the celebrities they’ve engaged. Direct access to decision makers – We shouldn’t underestimate just how good this access is. Read any of the diaries that came out from ministers in the previous Labour Government and you soon get a sense that they were in weekly (and perhaps daily) touch with the editors of the main newspapers. Add to that the fact that some of the advisors around key Ministers previously coming from the ‘fourth estate’ you can be sure that regular lobbying around some of the campaigns demands. I’m sure we’ll see articles in support of the campaign from leading political figures in the next few days. They accelerate the policy change cycle – Perhaps because of the demands of a daily paper, or as a result of the discussions that happen before a campaign is launched, previous newspaper campaigns have been able to move from launching the campaign to declaring victory within days rather than, giving a natural platform to announce the campaign success. I can’t see the Times campaign as being any different. In this campaign they’ve moved an issue that rapidly up the agenda of decision makers, and I’m sure across the country this weekend there are elected Mayors and Council Leaders trying to work what they can do to implement these suggestions. It’ll be interesting to see when The Times announces its first campaign victories, my guess it’ll be within days rather than the months it can often take for traditional NGO campaigns. Engage new audience – Exhibit A for this would be my father, he’s a loyal Times reader and a regular cyclist, but he’s not a natural activist but so I can only guess that because the issue has come from a trusted source for him (his newspaper) its been able to engage him, and no doubt others in a way that other campaigning organisations can’t. But what aren’t they so good at? Taking supporters on a journey – Go to the website and the campaign offers a menu of three actions you can take to immediately support the campaign – Pledge Support, Spread the Word and Write to Your MP – but I’m not sure what will happen next to my Dad and the 17,000 others who’ve shown their support. Will they hear more, or be encouraged to do more, or is their primary role to help provide the headline number? This is a space where a charity/campaigning partner working with the newspaper could play an important role, providing those readers who want to get involved in the campaign with tools and opportunities to do more. Generating actions – I can’t decide if I should be impressed by 17,000 actions or a little underwhelmed. It’s a decent number but given the amount of coverage, the readership of the newspaper and the heavy promotion that it’s got on twitter, where #cyclesafe has been trending for much of the week in the UK, it puts it somewhere mid-table when it comes to the number of actions that movements like 38 Degrees or organisations like Friends of the Earth can generate. Perhaps its simply shows the challenge of converting coverage into campaign actions. Seeing the issue to resolution – It’s too early to tell if this will be the case with the Times campaign, but given this isn’t the main business of a newspaper, it’ll be interesting to watch if the paper continues to monitor any commitments that are made to ensure they’re followed through on as opposed to simply being announced in response to the campaign. Do you agree? Should we be impressed by 17,000 actions? Does working with a newspaper provide a great opportunity for a campaigning organisation? Two excellent examples of campaigns ‘thinking outside the box’ when it comes to who they’re targeting with their actions show that we don’t always have to go after the ‘usual suspects’. First up is Greenpeace, who recently emailed supporters to ask them to support an action being organised by Liberate Tate campaign toward Tate boss, Nicholas Serota. At first glance it might not appear an obvious choice, but as the email to supporters explains ‘BP is one oil giant whose logo is splashed all over galleries and exhibition halls like the Tate. By using its profits to sponsor the arts, BP hopes to cover up the horrendous damage it’s doing to the climate and the environment‘. So it makes a great alternative target for their ongoing to highlight the influence of the oil industry. I’ve noticed this is an approach that Greenpeace employ regularly, another example is the campaign they ran towards VW earlier in the year, and its easy to see how focusing on targets like the Tate helps stop them always targeting the same small group of oil companies who are already likely to be resistant to campaign action but sensitive to changing perceptions of their brand. Secondly, the Global Poverty Project, who used the occasion of the Commonwealth Heads of Government Meeting (CHOGM) in Pert, Australia as a target for their ‘End of Polio‘ campaign. The CHOGM meeting, which happens every 2 years, is often rightly overlooked by campaigners, by the team at the Global Poverty Project appear to have capitalised on the increased scrutiny of the effectiveness of these meetings to score a great campaign win. Their success has shown that with the right campaign ask, can present an attractive ‘win’ for the host government which is keen to demonstrate the investment of time and money that goes into hosting the event actually got things done. 1. An imagination – The Tate Gallery or the CHOGM conference might not feel like the places that changes are likely to happen, but with a little bit of imagination it is easy to see how they can become useful campaign targets. They work because the organisations involved have clearly been prepared to spend time ‘thinking outside the box’ and no doubt investing a significant amount of staff time at really pushing into their routes to influence mapping. A good reminder of the importance of spending real-time in the process of campaign planning. 2. A clear overall campaign direction – The use of the Tate as a target works for Greenpeace, its not simply a case of appearing to pick on the Gallery because its part of a bigger campaign to highlight how ‘BP and other oil giants hope to gloss over their environmentally destructive activities, scrubbing clean BP’s public image’. I’m compelled to take the action because I can see how it contributes to a bigger campaign goal. For the GPP, success at the CHOGM meeting isn’t the end of the campaign, but a launch to call for further action from leaders to help eradicate the disease. 3. Being prepared to take the risk – Both campaigns could have failed. Leaders at CHOGM could have said they weren’t interested in pledging money, while the response from the Tate remains to be seen, but that hasn’t stopped the organisations behind the campaigns making the most of the opportunity. 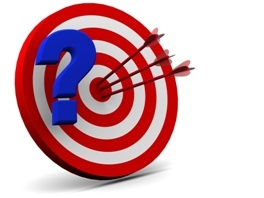 What other creative targets have you seen organisations focus their campaigns on? What are the 10 best campaign films? Can you help me put together a list of the top 10 campaign films? Here are a few more brilliant campaign/advocacy films from the last few months that I think could be worthy of inclusion in any list of ‘top advocacy films’. Do you agree? What else would you add? These films supplement my suggestions in this post from last summer. Use the comments box below to make your nominations and the reason why. 1 – The new Robin Hood Tax film that you can star in….It’s a bit too long and the ask at the end isn’t clear, but because I really like the way it invites supporters to be part of the campaign. A campaign first? 2 – VW: The Dark Side. Cleverly made by Greenpeace and because it created a media story when LucasFilms demanded it was pulled from You Tube. 3 – The secret Clooney Commercial that shocked Nespresso… by SOLIDAR, its been making me smile ever since I first saw it and because the campaign targeting is genius. 4. The Girl Effect. Simple but effective. I’d love to know what you would include? What would go in your list of top 10 campaign films?